Today’s a quick lunch since I’m leaving work early tonight. Thanks to some friends who paid me back for some concert tickets for my choir, I have some cash :). Karu Cafe never does disappoint on a cheap and quick lunch (cash only). I ordered the chicken and egg empanada ($2.72). The ground chicken is spiced to perfection, like a taco Mom made at home, using the Old El Paso taco spice mix; it meshes nicely with the chopped boiled egg in the golden brown dough pouch. Verde sauce is served on the side. 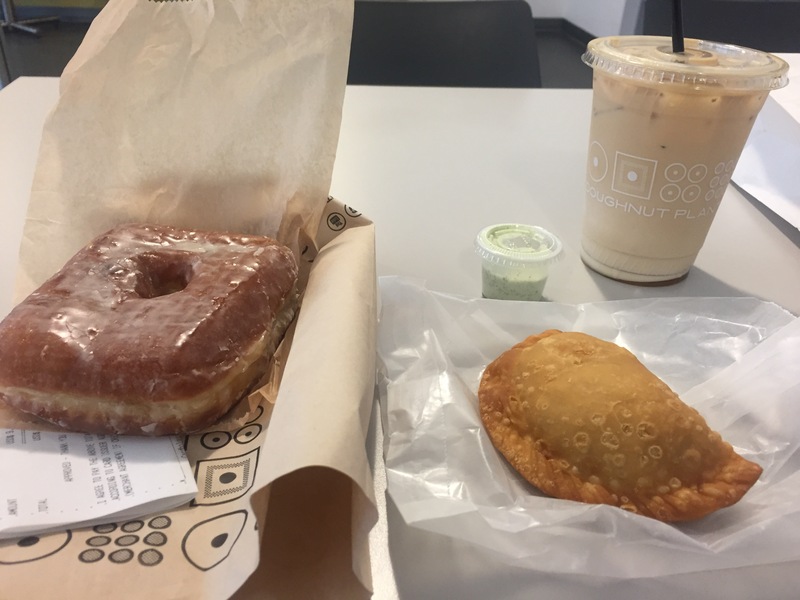 At the Doughnut Plant, I noticed they were selling Horchata drinks. What’s Horchata? It’s a drink made from three different milks: coconut, rice and condensed (types of milks and their consistencies can differ depending which Latin-American country you’re in), with cinnamon and other spices, usually brewed in a coffee drink, either hot or iced. To me, it tastes like a really intense chai mix, without the tea. Along with the iced Horchata latte (yummy and intense, indeed! ), I ordered my doughnut of-the-week: the vanilla bean yeast with blackberry jam filling. It’s shaped as a square with a hole in the middle. So delish! The jam (first time tasting this) was rich, tangy and berry-friendly. It’s the perfect end to the workweek: spicy notes to rev up for the weekend. Hope you have a great weekend as well!